We've had the same birdbath for a number of years now - it is a heated one that we can put out all year long. I posted in November about how we put it out for the winter after I found it when I was unpacking part of our basement. But, as part of the birding-related Christmas gifts, the kids also gave me a Water Wiggler. This isn't the first one of these I've had - I posted about our first Water Wiggler here back in 2013 - but based on that experience, I wanted another one. For details on how/why it works, check out my old post here. 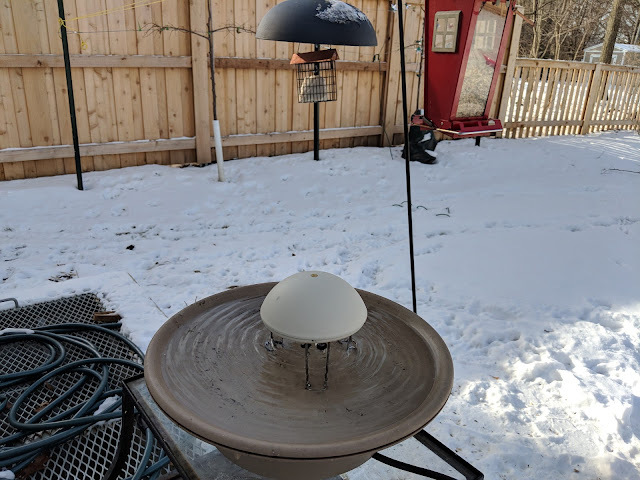 The biggest difference this time is that the bird bath is now directly adjacent to our feeder set-up. In our old house, we hung a feeder where we could see the birds, but the bath was connected to the railing on our porch so it was easy to refill. Those positions were in two different locations. Now? You can see that we've put the bath out just a few feet away from the feeders. I think this isn't likely the final location for the bath, but it is working now for the winter. I'm planning on planting the bed right in front of the bath this Spring - I posted the landscape plan for this area in October that shows some grasses, boxwoods, rhododendrons and hostas. I stuck the Disneyland Rose in the ground in this spot (I planted it there before we finalized the landscape plan! ), so it might either need to fit into the plan or I might transplant it somewhere else. I also ended up planting some hostas from the teardown that took place down the block earlier this year, too. One thing that we're going to have to do is to amend our soil around the foundation. It is A LOT of clay. I'm thinking that I'll have to see how many of the transplanted hostas and ferns that come back this Spring emerge from the mulch. Then perhaps I'll dig them up temporarily. Then dump on a good 6-10" of compost, take a tiller to work it in, then quickly sow the hostas and ferns (and maybe even the Disneyland Rose) back in. I think they'll do better - and I'll have a lot more luck with everything else, if we take a 'fresh approach' to the soil makeup right around the foundation. But, back to the Water Wiggler and our current Winter setup. The bath didn't really see a lot of action before the holidays, but since the wiggler went in, we're seeing quite a few customers come by for a drink. We've been talking about putting in an irrigation system for the yard and landscape beds. One of the posts/stories I read about bird baths and sprinkler/irrigation systems talks about how you can position a birdbath in the way/in line with one of your sprinkler heads/sprays. That way, you can always count on your baths being full of fresh water. Good idea, right?